The book offers you the kind of self-training that can make you a confident face reader. It contains comprehensive information about the nature and classification of different type of faces, and its astrological importance. In this book, author examines the lines on the forehead, the colour of eyes, the contour of nose, and the structure of face, These parts studied one by one and their deductions collated will be a replica of what you observed on a particular face. 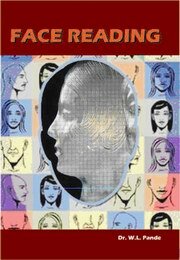 If you are interested to become a face reader, this book will help you to become good face reader. If you are already a good face reader, the book will help you to become a better one. Hope this book will be one of the best assets of face readers. Dr. Waman Laxmanrao Pande, born on 25.02.1939 at Lehni, Maharashtra, plays an eminent role in society as a face reader, astrologer, educationist, writer, vaastu shastri. He holds various academic degrees like M.A. Political Science, M.A. History, M.A. Sociology, M. Ed. (Poona University). He also holds numerous degrees in the field of astrology like Jyothish Bhaskar, Jyotish Ratna, Calcutta, Jyotish Gaurav, Delhi and Pune, Jyotish Vachaspati, Delhi, Jyotish Chakravarti, Ahmedabad, Jyotish Vidya Vardhani, Delhi, Jyotish Sri, Raipur. D. Sc. in face reading from Colombo University, Bharat Excellence Award, Delhi, Vijay Ratna, Delhi, Vaastu Visharad. Pune, and Vaastu Gold Medal Mumbai. His excellence in the field of astrology and face reading is clear from the degrees.